Gracious. I’m having a very exciting month. The whole Nathan Angelo thing. I signed my lease in Nashville today. Booyah. This guy comes to town next Wednesday. And tonight. This guy. Phil Wickham. Yeah, I’ve seen him a few times- like Nov 06, and March 07, and then Nov 07, which was somewhat of an embarrassing disaster. And every time, it gets better. He’s just SO GOOD LIVE. It’s insane. I’m telling you, you have GOT to see him live. Tonight was the first time I had seen him with a band and it was rad. My favorite song with a full band is Cannons- you can see a video here– it’s wide open worship and it about makes me want to jump out of my skin. That’s good, y’all. But then at the end, the band left and Phil went all acoustic on us. It was just amazing. I feel like even my words aren’t doing him justice. And it’s not “him” really, it’s how he loves the Lord and how he worships- so I guess what amazes me is how Phil connects with God. And let’s us watch. And participate. I want to move people towards the Lord like that. One of my favorite songs, Grace, spoke so deeply to where I am today. Seriously? I know. He’s good. Really good. I’m so grateful that God has gifted men and women on this Earth to know Him, and express Him, in a way that draws others of us closer to Him. Aren’t you? Because I NEEDED to say that to God tonight. 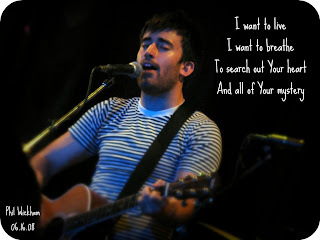 So thank you, Phil Wickham, for being an inspiration to me as a writer. Because you prove that to write really well, you have to seek God really well. I want to know God more after tonight. Someday, I’ll write a book. And in the back, with the other acknowledgements, I will thank you. I’m a better writer because of you.